Hey, it's almost Halloween! We at Steve Jackson Games love the spookiest time of the year, and not just because we spend the day at the office playing games on the clock. Dressing up in fun costumes, doing scary things, giving out treats to kids . . . it's all really fun stuff, and we love it. It's why we made the Munchkin Halloween Pack. 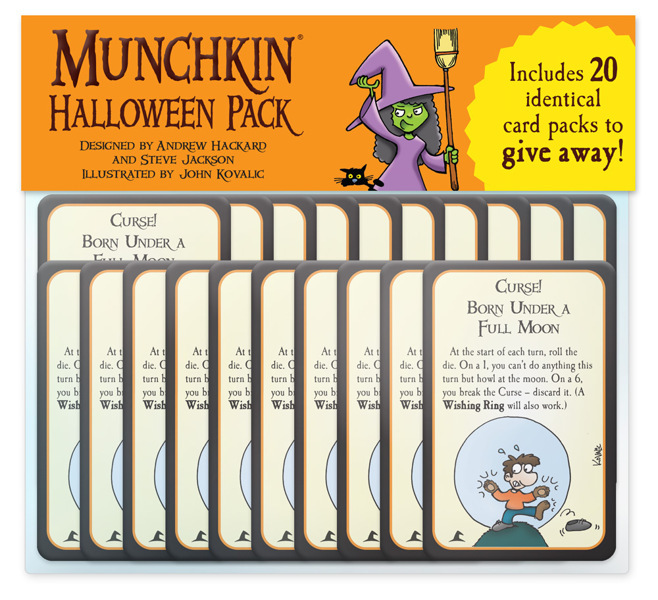 Wait, you don't know what the Munchkin Halloween Pack is? Okay, here's the skinny: imagine you have a mini-booster that has four new Munchkin cards in it, plus a card you can give to your friends to explain why this is so awesome. Now imagine you have 20 of those boosters to give out to kids at Halloween. (That is, 19 to give out. You're keeping one for yourself, right? RIGHT?) Now imagine that the whole thing costs you only $4.95. That's the Halloween Pack.